Come Face-to-Face interaction with more than 2,500 general internal medicine health professionals and healthcare leaders. Our conference theme is Courage to Lead Equity, Engagement, and Advocacy in Turbulent Times. View the SGIM Exhibitor Prospectus to learn more about this event. 2 Full Conference Registrations Value: $1,120. 10’ x 10’ Booth or 6’ x 2’ Exhibit Table (includes draped table, two side chairs, and an electrical outlet). Booth will include backing that can be used for display space. Additional services available. Access to Private Interview Room - Per scheduled availability: to arrange, contact Leslie Dunne at dunnel@sgim.org. Recognition on annual meeting website, plenary slides and social media communications; onsite signage. 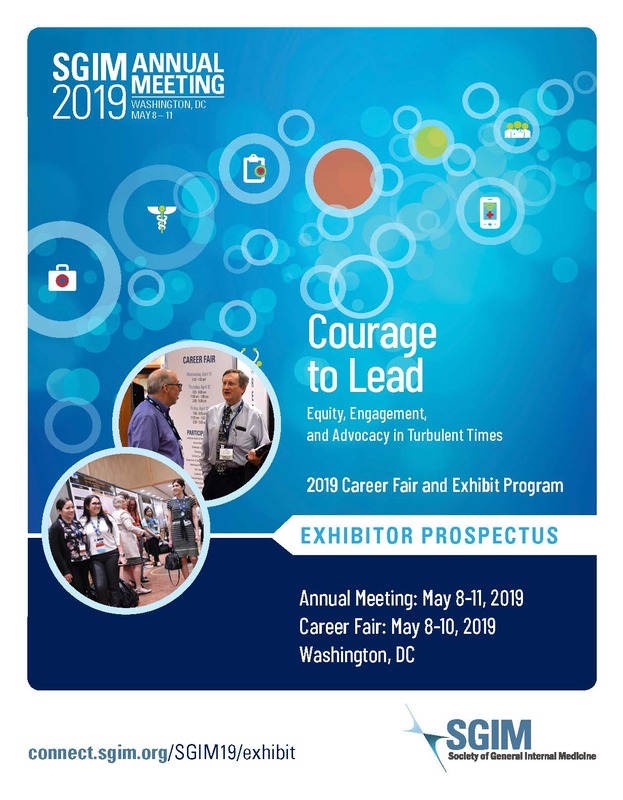 Exhibitor Profile in Meeting SGIM2019 Mobile App - Register by March 28, 2019 for inclusion in the Mobile App! Exhibitor Listing in Final Program - Register by March 28, 2019 for inclusion in the Final Program! Exclusive Opportunities for Print Advertisement in Final Program. Mobile App banner at additional cost. Limited space available. Participant Guest Room Hotel Rate - Pending room availability: Reserve by April 9, 2019 for special rates. Learn more (https://connect.sgim.org/sgim19/travel/hotel). Complete the Exhibitor Registration Form and return to dunnel@sgim.org or fax to 202-481-9663. Please note, SGIM reserves the right to have an expedited review of potential exhibitors to align with our policies.